“It worked!! !” Your product saved me $285.00 per battery last year. Sea Tow operates an emergency towing service for boaters in most US harbors. Working in such an extreme environment and providing an emergency service puts quite a bit of focus on properly functioning equipment. This is why we are particularly proud to be endorsed by Sea Tow! A very happy customer sent a wonderful thank you message via email. Customer thinks our product should sell itself, it works so good. 10 years and still going strong!!! A hand written account of Battery Equaliser’s ability to extend the life of lead acid batteries. 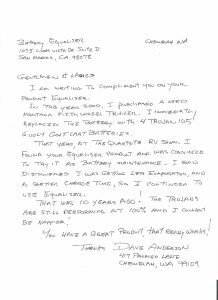 Thank you Mr. Anderson for such a nice letter, we hope you continue to use our product in the future.